Many of these have been made with hand-dyed yarns or in colorways that can be simulated but never completely duplicated. I'm looking forward to experimenting with more colors and fibers, AND I've even taken the plunge (literally!) into dyeing my own yarn. All the scarves are washable -- Click here for complete instructions. Each scarf is named for a well-known dulcimer tune. Happy browsing! These are my newest creations, ready to show at the Pocono DulcimerFest. The "Star of the County Down"
The "My Bonny Lies Over the Ocean"
What incredibly vivid blues this contains! The beautiful colorway evokes connections with water; "Bonny" and "Ocean" just seemed to fit perfectly together. Aqua, cobalt, royal, azure -- all blended with a dash of sparkle and shine. The "Lassie with the Yellow Petticoat"
This scarf reads as yellow, but the closeup reveals that it has all the colors of the eggs in an Easter basket. It's perfect for spring, or anytime you just want a bright, colorful lift. Fiery shades of red, softened with silvery ashes, create a cozy year-round scarf. Precious metals abound in this colorway, presenting shades of gold, silver, copper, and bronze. The clear mountain creek meanders along the sandy bottom, brushing against lichen-covered rocks and tall river grass, on a bright blue summer's day. LOVE these colors! Woven with a wool/nylon contrasting combination of light pastels and deep greens, blues, and purples. I was smiling the entire time I worked on this one, and could not wait to see what the next color would be. Too. Much. Fun. Presented in two different arrangements, both using the same supple deep blue hand-dyed rayon bouclé, with glints of gold, turquoise, and amethyst. Both have luxuriously long fringe and an exquisite drape and sheen. You will love how this feels! This scarf is made from the same hand-dyed rayon as "Over the Waterfall." It is long enough to wear in a variety of styles, soft enough to drape against your skin, and seasonless in its weight. This is the same wool/nylon yarn as "Wildwood Flower" (above), but in a completely different colorway. These combinations of loden and juniper, interwoven with a tan "camo" yarn would be perfect for fall. 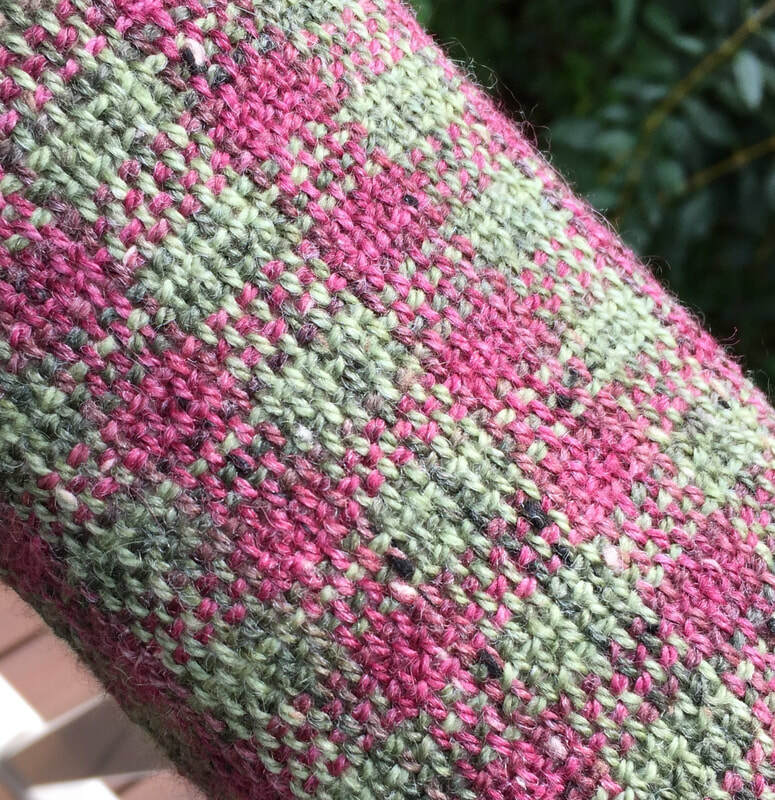 This is a delightful tweed yarn made with merino wool, baby llama, bamboo, and specks of Donegal, all of which works up into a delicious lightweight finished scarf of cranberry and moss green plaid. This deep rose arrangement of my favorite hand-dyed rayon bouclé ("Over the Waterfall" and "Blackberry Blossom") is presented with the solid color banding random stripes of deep jewel tones of amethyst, sapphire, and emerald. © 2019 Carol Walker | The Music Lady, LLC | All Rights Reserved.